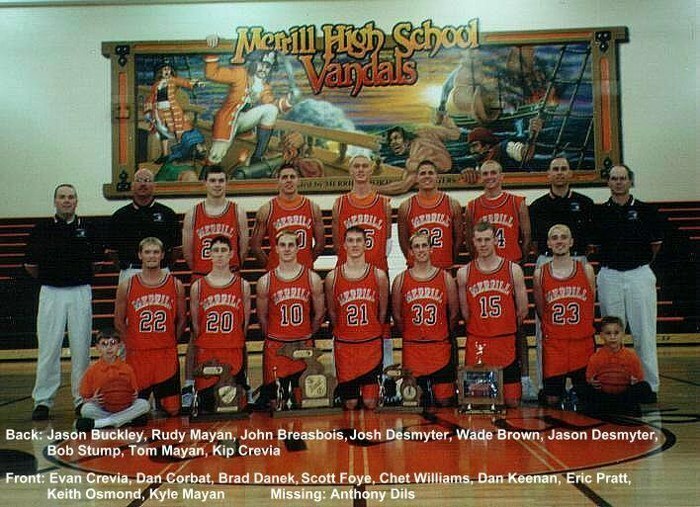 This team accomplished more than any previous Merrill VANDAL basketball team. They reached the state finals by beating perennial powers, Muskegon Heights and Detroit Deporres in the quarter and semi finals and were selected the Saginaw News top area team. Two of the players, the Desmyter twins, were named to the News “Dream Team”. Head coach Rudy Mayan assisted by his brother Tom, Jason Buckley and Kip Crevia, led the Vandals to a regular season single loss, prior to bowing to Negaunee in the state finals. Tom’s son Kyle, Kip’s son Evan, and Rudy & Tom’s nephew, Anthony Dils, served as ball boys.